Lesley Hazleton, author of three books about the intersection of politics and religion in the Middle East and a one-time Middle East correspondent for various publications, was understandably hesitant to explain, in a nutshell, the differences between Sunni and Shia Islam. Her latest book, After the Prophet: The Epic Story of the Shia-Sunni Split in Islam , is an effort to expand Americans’ understanding of that schism. “Essentially it was a battle over who would lead Islam after Muhammad died, and it began at the moment of his death, which is where my book begins,” she explained, noting that Shias maintained that Muhammad’s bloodlines should determine his successor, and Sunnis advocated merit and consensus for making the same determination. “If I had to boil it down, and this is a big if, it was a battle between idealism and pragmatism, and still is.” Hazleton chatted with Zócalo about the story behind the schism and why it still matters today. A. It was after a particularly horrendous suicide bombing in Iraq. The question that came to mind was how the prophet of unity – the prophet of one God, one people – could leave behind him this awful, seemingly unending bloody legacy of division between Shia and Sunni. That led me to read and read and read. I finally went back to the earliest Islamic histories, and found The History of Al-Tabari, this amazing history which is 39 volumes in English translation. I started reading it, and oh my God, it was so vivid, so visceral. It had a story that, if it is told at all, is usually told in the West in a mere two or three sentences. If I were to try and tell you the Christ story in two or three sentences, you’d say, “Yeah, well, that’s not quite it.” Would those sentences explain why people have been willing to die for this, or kill others for this, for centuries and centuries and centuries? But in full, Al-Tabari’s history suddenly just leapt to life, this amazing narrative. Everything is in it. It really is an epic. There is power and intrigue and rivalry and assassination and manipulation and greed and faith and a cast of characters that would make Gabriel Garcia Marquez absolutely green with envy. And a lot of it comes down to people recalling what they’ve heard about the events – a lot of it is direct quotes, direct dialogue, even down to the curses. When you read something like, “May your mother be bereaved of you,” my God, the four-letter words used in the mean streets of American cities seem mild by comparison. So here was this magnificent story that nobody in the West seemed to know, though it is well-known as history for all Sunnis, and is tragically engraved among the Shia as sacred history with immense, enduring and emotive power. What I wanted to do was bring Western readers inside the story so that we can experience the power and depth of it, and understand why it has endured for so long and why it served as one of the main inspirations for the Islamic Revolution in Iran in 1979, why it serves as the inspiration for Moqtada al-Sadr’s Mahdi army in Iraq right now, why this divide within Islam continues to inspire at all, and why it continues with such depth. When you think about it, it has to have been an amazing story in order to reach so deep into the innards of those who hear it. I really wanted to let westerners in on it, so we can know what on earth we walked into. Q. You’ve discussed the vividness of the story, but I’m curious what else you found surprising as you researched? A. I knew in 2003 that invading Iraq would be a mistake but I didn’t know the depths of it. I kept on saying to myself as I was reading these histories, what have we done? What have we put ourselves in the middle of? That comes from really appreciating the depth and power of the split. I was incredibly impressed by the way [the split] is still used and still manipulated politically. There have been long eras in the history where Shia and Sunni have lived together relatively peacefully side by side. There are other times they haven’t. The split is always there, it can always be used. It’s like a Pandora’s box. And of course, the suspicion now is that the U.S. has deliberately opened it up in order to weaken Islam from the inside. Although this is odd to Western ears, once you know the story, you can begin to appreciate it. Take Yazid, who was the sixth caliph and who was responsible for the core event of this split, the massacre of Muhammad’s grandson Hussein and all his family at Karbala – during the Islamic Revolution in Iran, the Shah was called Yazid. In 2003, Bush was called Yazid. These are images and battle cries that can be called on at almost any time. We walked into it all unknowing. Arrogance doesn’t even begin to express our attitude. I just really, really believe we need to respect the story, we need not to take sides, not to find out who are the good guys and who are the bad guys, which is what they do in foreign policy – support Sunni, support Shia, support Sunni, support Shia. It’s very American, this idea that everything can be fixed if you just find the right balance. Mike Mullen, the chairman of the Joint Chiefs of Staff, said just a few weeks ago that what we need to do is step back and listen and respect what we’re hearing. The problem isn’t that they don’t understand us, it’s we don’t understand them. We don’t understand what’s sacred and what inspires people and what motivates them. This is why I wrote the book. It’s very American to say all this happened 1300 years ago, that’s ancient history, why can’t we all just get along? But that doesn’t work. We have a relatively short history here of 200 years; Iraq and all of the Middle East has the oldest history in the world. What’s important for us to understand is that history is present in the Middle East. There is no difference between then and now. What happened in Karbala in 680 might just as well have happened yesterday. It is that fresh in people’s minds. It’s almost as though in the place with the most history in the world, there is no such thing as history. Q. What would have changed, if anything, if we’d known this story before we went to Iraq? A. It’s very, very tempting to think if they’d only known the story, they never would have sent U.S. troops within 100 miles of holy cities like Karbala, where Hussein was killed, and Najaf, where Ali, the first imam of Shia Islam and the fourth caliph of Sunni Islam, is buried – and there’s a world of difference there between imam and caliph. But I know that’s wishful thinking. On the other hand, if more of us had known the story, I think our argument against the war would have been far, far stronger. With that particular Bush administration, it probably wouldn’t have made any difference, they still would have gone. But those of us who were against the war would have had far stronger voices. That much I can say. Q. Why is that? What about the split makes the argument against war stronger? A. We would have been far more aware of the history of Western intervention in the Middle East – not just what happened to create the divide between Shia and Sunni 1300 years ago, but also what happened from the Sykes-Picot Agreement of 1916, by which England and France carved up the Ottoman Empire, to the British imposition of a foreign Sunni king in Shia-majority Iraq in 1922, to the overthrow of Mohammad Mosaddegh in Iran in the early 1950s and the British support before World War II of the former Shah of Iran, who was a Nazi sympathizer. We would understand the effect of American support of the Shah, and of course the recent American invasion of Iraq. Any American action in the Middle East now is seen with such suspicion after all these failed interventions, all of them essentially based on ignorance. This is not given to easy fixes. If there is one thing of prime importance to all Muslims, it is resistance to the idea of being manipulated from without. This growing suspicion of the U.S., perhaps totally unintentionally – and history tends to be a matter of unintended consequences – may help bring Shia and Sunni together against the West and against Western intervention. The sheer arrogance, the cavalier fashion of intervention throughout the last 100 years has been amazing. That arrogance is the story of Western intervention. Q. How are we doing now, with the shift of the war to Afghanistan? A. You know, what we’re doing in Afghanistan now, we’re using, thinking it’s very clever, Shia military units to patrol Sunni areas. Not only are they Sunni and Shia, but they’re also ethnically different – we’re using Hazari Shia patrols in Sunni Pashtun areas. This is not clever. We think we know what we’re doing, we’re playing them off each other, but you can’t. Until we can appreciate what’s at issue here, we’re going to dig ourselves a deeper and deeper hole. We’re making things worse both for ourselves and the people in Afghanistan, Iran, Iraq, Pakistan. It’s a lack of respect for other people, other cultures, and other faiths. It’s pretty hard to conceive of how we could demand they respect us when we do not respect them. Q. How do we return to the sort of peace you say has existed in the past between Shia and Sunni? A. Tolerance for sure. When we say peace we have a very idealistic image of peace, of people falling over each other to call themselves brothers and sisters. The peace I like to look at is the peace between Israel and Egypt, who do not like each other at all. There is no element of brotherly-sisterly cooperation. It’s a very very pragmatic matter, it’s in the interest of both countries not to be at war. I think when it’s a matter of idealism and pragmatism, you ask, where do you compromise, how does pragmatism win the day over idealism, under what conditions. There are periods of peace in which Sunni and Shia were simply very pragmatic. It was in the interest of everybody to not make a big issue of [the split]. But the story is so powerful that at any moment it can provide the impetus for a renewed outbreak. In the Iranian revolution in particular, Khomeini transformed it from a tale of mourning and disinheritance into one of liberation, of claiming one’s freedom, and it is now read quite generally through the Shia world as a story of Shia revival. I’ve always been fascinated by this interplay between politics and religion, it’s something I’ve looked into in my two previous books on Mary and Jezebel, and it’s clear to me that it begins with politics. It’s a matter of who has the power, and then the story becomes theologized, as it were. Then it achieves another level, and the ways in which it can move people and rouse people become far deeper. 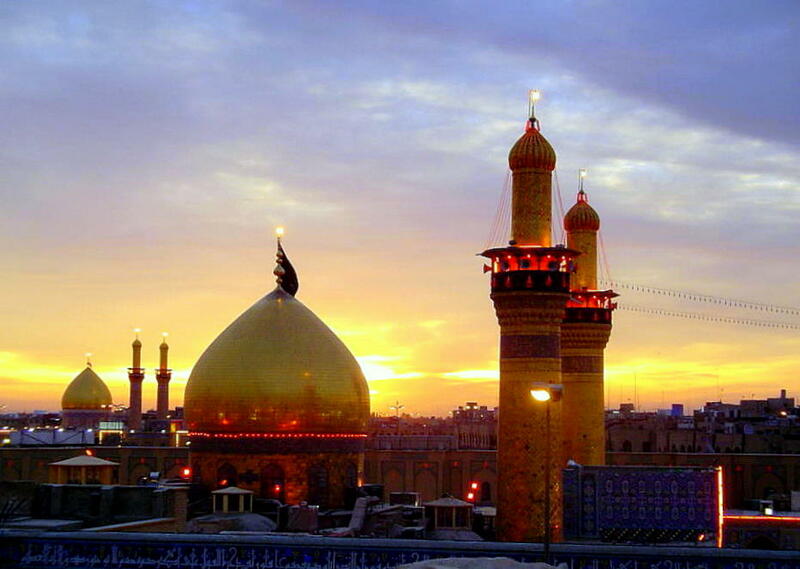 *Photo of Karbala courtesy jamia. Photo of Lesley Hazleton by Lesly Wiener.